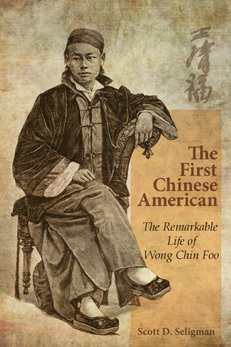 Ancestral Discoveries: The First "Chinese American"
The Chinese Historical Society of America will host a reading this Thursday, June 20, by Scott D. Seligman, a historian and genealogist, and author of a new book about Wong Chin Foo (1847–1898). The book, The First Chinese American: The Remarkable Life of Wong Chin Foo, discusses Wong's life and campaigns for racial equality in the 19th century. Wong founded the first association of Chinese voters and testified before Congress to have Chinese exclusion laws repealed. The talk will be held at the Chinese Historical Society of America, 965 Clay Street, San Francisco, California from 5:30–7:30 p.m. The talk is cosponsored by the California Historical Society. More information and a link to RSVP on Facebook can be found here. This sounds really interesting. I wish I could attend, but there is no way I can get there in time from work in Dublin!